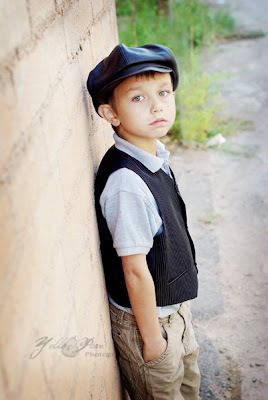 And here we have Dennis looking eversodapper in his hat and vest....do not be fooled by his angelic face, I know better. He is a handful sometimes, but always a crackup. While climbing the ladder to adorn its branches with ornaments, he decided to jump off the second to last rung and while preparing, he would sing "One for the money......uh...two for the whatisitagain...oh yeah show....three to get...ummmmmm....READY...and howmany...oh...four. to. GOOOO!" And with a flying leap he would jump off and then run to us yelling, "Did you see that? That's what I call 'Wise Guy Flies'!" Sheesh, he is a wise guy!! I told them to not smile...so this is what I got....a wierdtoobig-eyed face on C...and then a crazyopenmouthed-grin from N (who I could only get about 4 smiles out of total and then this...goodness, see what I mean about wise guy?!) But I do love it, it's hilarious! And the C-man himself...what a sweetheart. He was sick the other day with a stomach bug...ick! He was up all night, therefore I was up all night. Every 20 minutes or so he would be up sick and I would run in to help rinse bowls, wipe his forehead and you know...mom stuff. Anyway, everytime he would look at me and hug me and say "Thanks Mom for helping me, I know you are very tired." It took me by suprise, why wouldn't I help my baby when he was sick? It's what moms do...but the appreciation was so wonderful...moms don't always get that. Without fail, 20 minutes later, it would all happen again and another Thank You would follow. One time he even said, "You're eyes aren't so red anymore." I guess I really was tired! He is trying to get a full belly laugh, we've gotten a few extended haaaa's and lots of coo's and squeals. 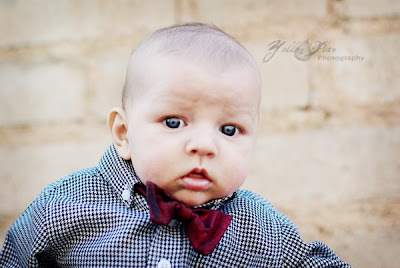 He was 14 lbs at his 2 month checkup (goodness). His incision from his surgery is healing very, very nicely and he is doing good all around. He loves mostly to smile at all of us, furrow his eyebrows and slurp on his fists. He is trying to grab at toys and batting them around. As of today, he is 2 1/2 months. They are all soooo cute! Little Q is adorable! I am glad he is recovering well. such adorable kids. I love the paragraph on B...it totally could have been my Hannah you were talking about. Good intentions, but leaving a mess in her wake. Love it. Love the outfits. So glad to hear that the little one is growing so well despite his complications. Erika, I didn't know so much was going on at your place! I'm so glad to see you are both recovering well. Loved your thoughts about enjoying the little things more. Take care! Yeah, I did a pretty dern good job! Got the Christmas card today... Beautiful family! THANKS!! 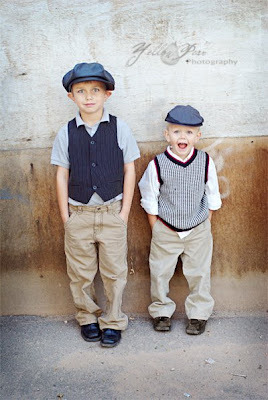 Love the kids in their hats and little Squire's bowtie! Adorable! 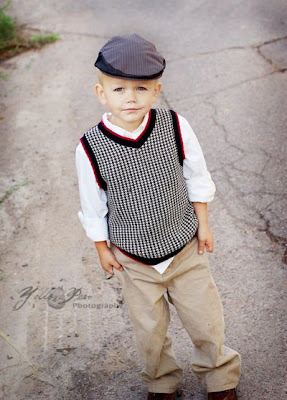 Nate saw just the picture of n and said, "I didn't know he had those clothes, he looks like he is from France." I love the Christmas tree! That's awesome. We thought we got a tall one this year, but that thing's huge! I'm glad to see people still get real ones, this is our first year with a fake one and it's kind of sad. Good job! Oh! 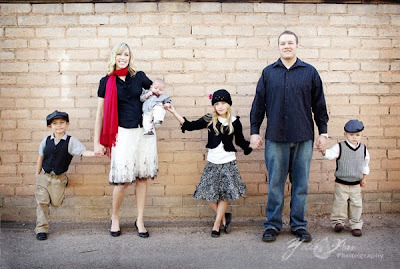 What great family pictures! I know I have said it a hundred times but your talent astounds me. We are trying SO hard to figure out how to touch up our Christmas pictures... oh man it is not going very well. You are AMAZING! I cannot believe how much little Q has grown! He is so big. What a cutie! And your other kids are so beautiful! What a great looking family. Love the brick wall! Erika - they are all so grown up? Where did our little ones from MN go? 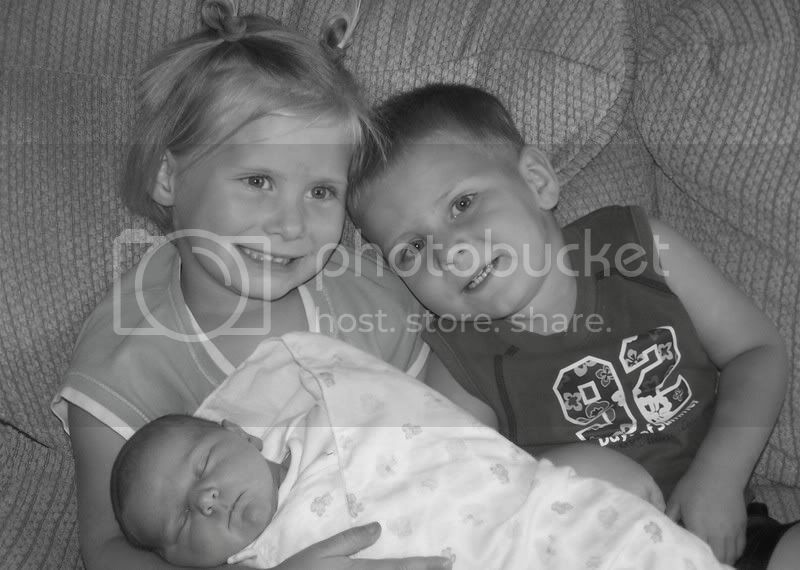 It seems like just yesterday we were taking baby pictures of Bryant and Christian. Now look at them. Amazing how fast they grow up - it is so fun, but kind of tugs at the heart strings a little too. Oh my gosh! They are so precious! I am so jealous! I have been trying to do some fam pics but with twins and a tripod...way too hard! Love the pics they are beautiful!! !